When I first thought I should get a travelogue sent out, it was mimosa and almond blossom time in Turkey! That was over a month ago – oops. For one reason and another the time to settle down and get our activities written up has just stolen away. However I am now sitting on the boat in Kos marina with a list of things to get done and top of that list is to update the last three months of work and play. This may take some time. Once we had returned from our trip around the sites of Pamukkale and its environs, there was only a month until we hauled Alixora out of the water for her annual bottom scrub and general fixing. During that month we had almost a week out on an organised trip to Istanbul, so time was pressing. 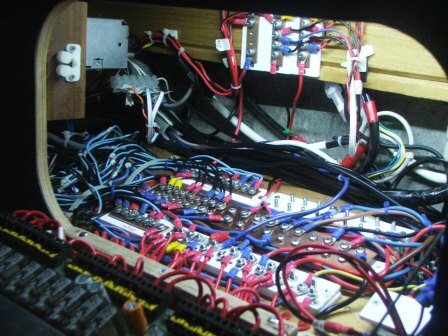 Brian continued to work on improving the electrical system making and installing bus bars in the control panel cabinet so that the wires would not pull out of the control panel each time we opened the front of it. It looks fantastic now – very neat and tidy. He used the copper bar that he had “acquired” from his friends back in Manchester and cut up bits of old sail batten that had been sitting in our wood pile as the backing. The batten had been rescued from some marina or other (we have flat and round) but had degraded being out in the open all the time with tiny bits of glass fibre sticking out – ouch. Brian used the car spray paint to seal it up again and it makes a fine insulated base. As he was working outside much of the time drilling and tapping I capitalised on the ability to work in the saloon, got the sewing machine out and made a few more pairs of shorts and a pair of trousers ready for summer. Our old shorts fall to pieces after a year or three in the sunshine, so we are well set up now. The weather alternated between warm and sunny and cold, wet and windy – about half and half. Turkey has suffered from a mild winter and there was much less snow on the mountains inland than usual. This means that there is likely to be a water shortage later in the year. Intended trips out to local wildlife areas were postponed as we used the warm days for the boat work we were doing! The deck of the boat needed scrubbing and cleaning with various preparations to get rid of the winter buildup of soot and salt, then polishing (with car polish) twice to try to keep the surface clean for the summer. Jeri and Curt invited us to their house for a lovely dinner one night, which was a very pleasant change. A few yachts people arrived and then left again – so we had a few good social evenings in Meymekan – the marina bar/restaurant. We watched the news of the foul weather in the southern UK and commiserated with both sisters who live there. The north seemed to have escaped without much in the way of disaster although we were impressed with the pictures of waves breaking over lighthouses along the Welsh and Cumbrian coast. I had bumped into a New Zealand couple from Yat Marin (Marmaris) in the marina supermarket in December – they had just come to have a look around. During the course of our conversation they revealed that they were returning (by boat) to New Zealand and had to re-home a dog they had adopted in Marmaris. Eventually I remembered (in February) and sent them the link to Colin – the Kas expat communications circulator. Amazingly this resulted in their dog Sweetie being found a home in Kas and we went out to dinner with them and Steve and Deidre when they brought the dog over. My good deed for the month! Another piece of good news was that I qualified for the State Pension at the end of March. Brian’s sister kept me up to date with the vast quantity of paperwork that came. I had applied for it online during January so it wasn’t a complete surprise. What was a surprise what that somehow I had managed to rack up additional contributions (don’t ask me how) so it is more than the basic allowance. Brian of course has to wait a few more years! 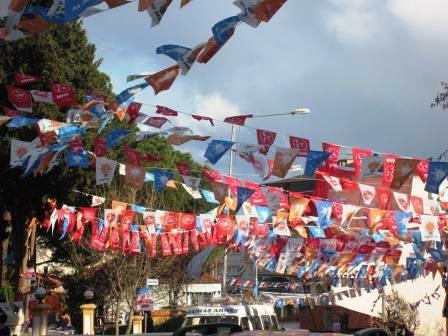 During the two months up to the end of March there was a huge build up to Turkish local elections. Each party had vans professionally painted with their slogans and pictures of the candidates. There was some international reporting on the importance of the result especially in the light of the (to us) dictatorial dismissal of corruption investigations around friends and relatives of the prime minister and subsequent replacement of senior judges and police. In the event, the AKP ruling party was successful (even taking Kas), so we will see what happens next. 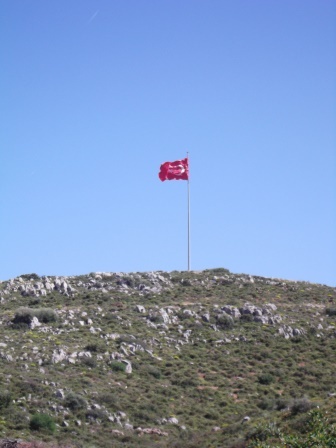 The local reason for their success in Kas was explained that the mayor of Kalkan was the opposition candidate (CHP) and no-one in Kas wanted him in power as he had made such a mess of the tourist development in Kalkan! Anyway, the effect was that we were bombarded with music, declamations and propaganda broadcast at full volume from these vans as they toured around the town – constantly. No day was peaceful. Eventually you just cut it out as background noise, but it was very tedious. The day after the election was so peaceful! So it was quickly time for our trip to Istanbul, organised by Ziya, the Setur Marina manager in Finike. He had recently taken over and was previously in marketing, so was very keen to get people together and visit more of Turkey. In the end over 20 yachties from Finike participated, us plus Steve and Deidre from Kas, and a Danish couple from Kusadasi – all part of the Setur marina group (they have 7 in Turkey and one in Lesvos, Greece). Umit, the Kas manager, organised our plane tickets from Dalaman and we set off on Thursday 20th February – kitted out with warm clothes for the cold in Istanbul! The hotel was right in the middle of the old town – fantastic deal and very posh. 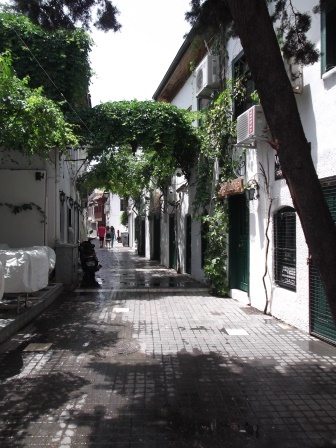 We met up with the other groups later that day and Ziya took us on a whistle stop tour of some of the highlights of the local area including Pera street leading up to Taksim square. We were let off the leash to find our own dinners which we did with the Danish couple in a back street “French” restaurant. 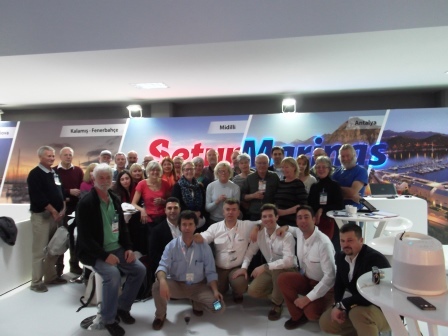 The next day was the visit to the Istanbul Boat Show. Ziya had decided that we would only need an hour or two there – he doesn’t yet know much about yachtsmen! So initially we went down the hill to the edge of the Golden Horn and the spice market. Brian and I walked over the bridge instead where scores of people were fishing off the edge. Then we got a combination of tram and train to the exhibition area – it was huge. After meeting back at the Setur Marina stand after our alloted 1.5 hours, most of us just said we would stay on and continue to look around. Brian and I headed for the chandlery areas – two huge halls full of lots of useful and needful things (sorry Stephen King). Brian checked out batteries, formulating a plan to put in an additional starter battery, releasing the existing one for domestic use. We made a booking to have some engine work done in Marmaris with one of the companies there, and found almost exactly the replacement ring pull catches that are on our floors. The ring bit has a nasty habit of breaking off if caught accidentally and we had run out of replacements. I had been looking for them for two years! We bumped into a couple we knew from Kas who had come for a concert by a famous blind opera singer. Finally we headed back to the hotel, found a bar and had a couple of drinks and dinner before collapsing. 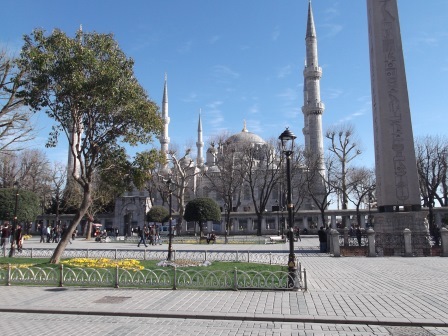 On Saturday we were led by a registered tour guide around the main attractions – the hippodrome, Blue Mosque, Hagia Sophia and then the Topkapi Palace. Quite a lot to take in in one day! The guide’s accounts were interesting too – a good way to visit in some ways, but on balance we still prefer to take our own time wandering round these places and being able to spend more time on things that interest us! We were let to do our own tour of the Palace for an hour or so, and found the armoury which was fascinating – and heated! When we met up with the group later the Kas four decided we had had enough so went off for a beer close to the hotel. Saturday night, I had made arrangements to meet up with a woman Gill had befriended last year in Teos. Dilek is planning to sail the Atlantic single handed – the first Turkish woman to do so. She arrived to pick us up at the hotel with her husband and friend, and took us to a very smart restaurant in the Armada Hotel on the shores of the Sea of Marmara where her friend’s wife was waiting as well. We had a lovely meal, and were delivered back to the hotel to collapse once again. Sunday was slightly more restful – a boat trip up and down the Bosphorus. It was cold, overcast and misty, but very interesting to see all the old palaces and more recent desirable residences perched on the shores. We were followed by dolphins which were probably attracted by fish in turn hunting the swarms of jelly fish in the water. The straits are busy with big ships – a one way system operates so they were all going north when we were there. You can see the incredible current swirling around the edges of the channel – this is where a lot of the cold water comes down from the Black Sea into the Mediterranean, making the north east part of it quite cool! In the afternoon, after a fish sandwich by the water, we visited a military museum which is not often on the tourist agenda. Part of the attraction is a concert by the Mehter band – a reconstruction of the fierce music played by the Ottomans when fighting. It was very atmospheric and most enjoyable. The museum itself is huge and interesting – we didn’t have enough time to explore it all. Monday was our last day and it rained. Fortunately we had not visited a couple of indoor attractions. The first was the massive ancient cistern next door to the hotel. It was re-discovered in the last century. Next was the Grand Bazaar – again a huge under cover area full of small shops – jewellery, clothes, tourist tat and the like. We found our way around and met up with our friends after an hour or two without getting too lost! It was time to return to the airport for our flight back to Dalaman. We met another couple from Kas (full time residents) who we had not seen for a couple of months. Surprising how you bump into people in the most unlikely places! The next few days we spent recovering from the manic visit to Istanbul, doing more work on the boat and making arrangements for our liftout on Monday 3rd March. Brian has replaced most of the insulation in the engine compartment with new foam which has an aluminium foil exterior. Along with putting LED strips in for lighting and a complete clean of the engine itself it is all very shiny and bright in there now. Our friends Jeri and Curt were kind enough to let us have their town centre flat again for the duration of the boat being out of the water. We carefully slotted our time in to fit in with Gill and John who were scheduled to take Petronella out of the water a couple of weeks later and then take over the flat. This time we took off the genoa (front sail) as advised by the marina and I decided to attempt to clean it while we were on the hard. Monday arrived and it started to pour with rain. Notwithstanding, we set off (nice quiet engine with all that new insulation) and Alixora was placed in the slings, lifted out and tucked away next to the new tennis court. Fortunately for us, the rain that continued for the next couple of days didn’t hold us back, as we were just washing down the hull, taking off the weeds, slime and barnacles that accumulate after a lengthy time not moving. The below water hull and antifoul looked a lot better than last year – not much to sand off on the plastic, but the keel didn’t fare so well. Brian sanded and ground off big chunks of old gel coat that had peeled off and consulted the online forums for advice on how better to stop it rusting. 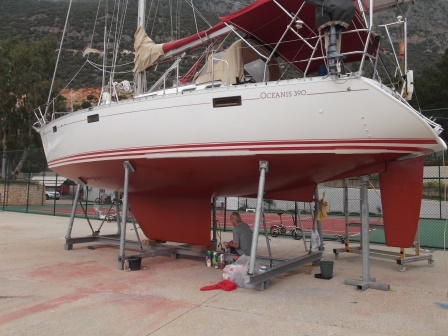 We contacted the chap in Gocek who runs a Beneteau dealership who advised that he thought the keel is solid cast iron. With frequent trips to the chandlery Brian decided to put an anode on the keel itself, and paint it in epoxy primer, then metal paint then antifoul. Thanks to his friend Andy who advised on how to tap a thread into cast iron. We will see what happens next year! 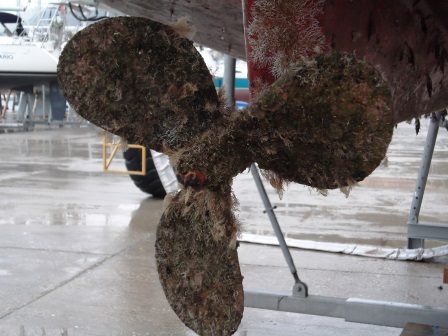 Another interesting tip came with our various efforts to prevent the propeller fouling up with barnacles. 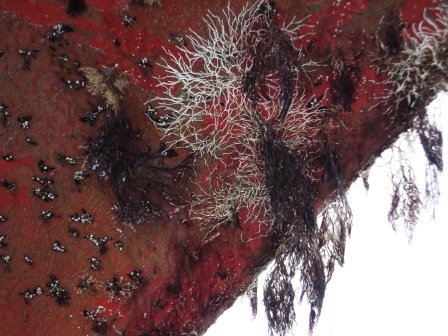 Brian had put antifoul on it last year – this had no effect other than to form a hard calcium layer under the barnacles which was a pain to remove! So this year he has coated it with lanolin grease. Dave and Melinda on Sassoon who had recently returned to get their boat ready for the season said that some people in New Zealand had discovered that felt tip pen worked rather well! However they have not let on what type of pen was the winning solution – no doubt in order to patent their discovery! Interestingly, Brian found that felt tip pen marks that I had put on the hull last year to mark out a grid for the 2nd coat of antifoul were still there – hmm. Why, you ask, do you mark out the hull with felt tip pen? Well, it’s the same as painting a wall with two or three coats of the same colour paint – you can’t see where you have painted after a while, so the grid helps to keep you on track and the antifoul is very thick so covers up the marks. Several people thought it was a great idea! Another useful tip for cleaning out pipes that I used (a rag tied to the middle of a long piece of string that can be pulled to and fro) was another one that people thought was a good idea – we all pass on these golden nuggets of information! Our days fell into a routine of tea and breakfast in the flat, shop if necessary, drive to boat, work, coffee, work, lunch, work, shower, beer and back to the flat for dinner and collapse. But one night we went out to John Douch’s 60th birthday dinner in Meymekan. A great time was had by all and loads of people turned up. Gill and Kevin had spent some time decorating the room which looked very festive (while Ann was helping us on the boat – she is standing in the picture). Final work was carried out in warm sunshine after two weeks of cold and wind – a lot of the white paint at the waterline had degraded so I sanded, cleaned and painted the bits that were peeling off. Then of course we taped that strip to paint on the antifoul (helped by Gill and John). Lo and behold more white paint came off when we took the tape off! More last minute sanding and painting. Brian spray painted red on the anchor chain to make the 20 and 40 metre marks more noticeable – we usually let around 30 to 40 metres out so this will help a lot. It was soon time to launch again – we were happy that everything was ready. It was nice to be back in the boat again, with everything in one place. Gill and John took over the flat and started to work on Petronella which had been lifted and placed where Alixora had been. Finished at last apart from those dratted bits of tape! 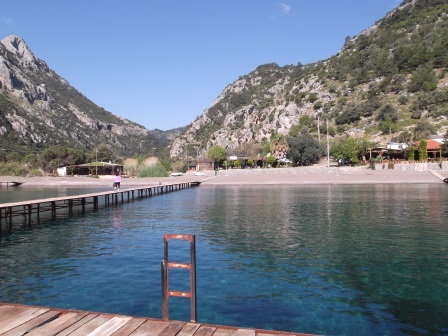 There were only a couple of weeks left until we set off – we had a list of work that had to be done in Marmaris due to the limited facilities in Kas. Brian carried on working on some fibreglass fixing inside the boat, and on more electronics. We did a big clear out of redundant “stuff” and Brian dismantled one of the old freestanding loudspeakers. He used the volume control/on/off switch from that to add to the amplifier he had built over winter. Great improvement. I revarnished the dinghy boards, Brian cleaned and teak oiled the seat. 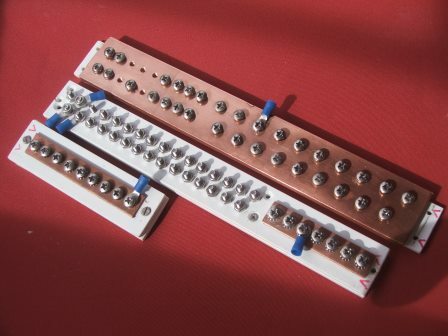 I found backup electronic connectors (USB to various other sockets) for our charting software – the existing ones still work but it was nice to have replacements to hand. 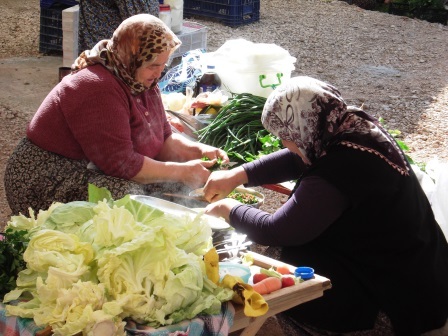 We stocked up with things that we knew were easy to find in Turkey but not elsewhere. One day we took a break and drove to Patara hoping to see a few migratory birds. In the event we didn’t – just a wheatear and a blue rock thrush and the ever present marsh harrier. But I am sure we heard bee-eaters in the distance! 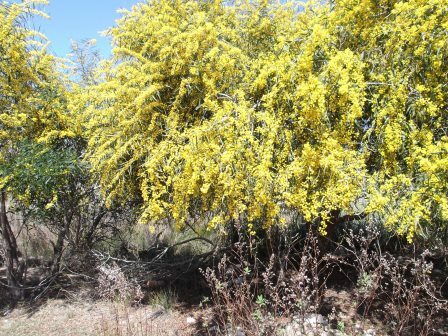 The mimosa was in full bloom and covered the sand dunes and rocky outcrops. Beautiful. That was when I meant to start this blog, but somehow it never happened. One night we went out for a farewell dinner with Jeri, Curt, Gill and John to the Kurdish restaurant Natur-el with a fireplace – it was still rather cool. A very good meal as ever and excellent company. 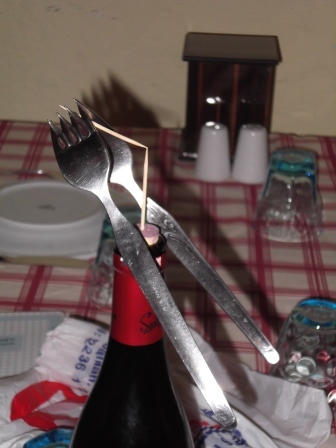 The owner delighted us with some “magic” tricks at the end of the evening! Another night we were invited up to Dave and Melinda’s flat for an excellent meal. Other people were coming back for the new season so it was a very social time. 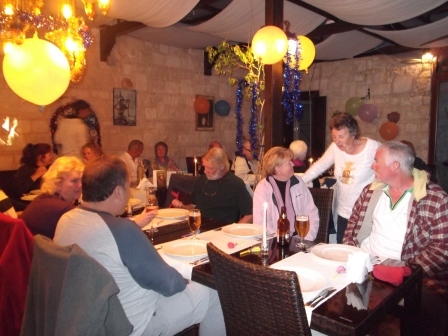 Having decided we would leave Kas on 1st April (a significant day – five years to the day that we first took Alixora away from Rhu Marina where we had bought her to sail to Holyhead) we arranged a big farewell do at Meymekan restaurant – Gill organised dips and chips for everyone too. A great evening, we were sad to leave and Umit the bar manager was surprised to get a big goodbye hug! The next day 10 people gathered on the pontoon to wave us farewell – Jeri and Curt racing up at the last minute to throw us a huge lemon from their garden for scurvy prevention! I haven’t cut it up yet. The other Umit – marina manager – emailed to say he was sorry not to be able to say goodbye – but I did give the staff a couple of big fancy cakes as a farewell gesture! We left our car with Gill and John as it still had two weeks left on its rental. It has been lent out to all and sundry over the past few months as the excellent deal is that anyone can drive it! The fact that we have left behind good friends that we had made over the past three years only really sank in when we got to Greece and realised that our time in Turkey had really come to an end but we may see them again in different places and we will keep in touch courtesy of the internet. The trip up to the first stop (Karacaoren) was uneventful and warm – no wind to speak of so motoring all the way and we had a pleasant dinner at the restaurant there (but bitten by mosquitoes – the first of the season). We were only the 6th yacht to stop by this year. The next day we were able to sail across Gocek Bay and moored to a buoy for a couple of days in gorgeous sunshine – peace and quiet and relaxation after a month of hard work. There were a lot of jelly fish in the water here too. At night all you could hear was the call of owls and the splashing of fish. We set off for a bay just south of Marmaris after our rest break. Over the few days of our trip from Kas out at sea we had seen at separate times three hoopoes flying north close to the water. They migrate from sub saharan Africa, so we have seen some migratory birds at last! It is quite weird seeing a bird like that completely out of context – they are normally scratting around in dusty soil under trees. On Saturday 5th April we arrived at Netsel marina ready for the next stage of fixing and improving Alixora. I had already spent some time collating information on suppliers and making a list of the things we wanted to do and to buy. First though, it was my birthday, so after a walk round the chandleries to reaquaint ourselves with the layout, and a shower and clean clothes, we set off for our favourite restaurant Neighbours. 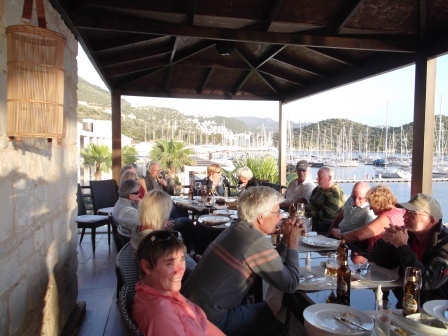 A group of other British boat owners was already there – I recognised one or two – holding their own farewell dinner for some of them. We had a lovely meal as usual. The next day being Sunday and few businesses open, we sorted out a schedule of work and got ready for the week ahead. The accomplished work included: stainless struts to hold the bimini more firmly against the gantry at the back; a new oil seal on the crank case; a repair to the genoa where it was beginning to get worn; saloon window seals dug out and resealed and new perspex in the forward cabin hatch; the steering sheaves fixed with new inserted brass bearings and new aluminium axles; a new bathroom tap mixer with shower hose; new thicker cockpit cushions in a maroon and beige stripe; restitched bimini; new cranking battery, new connecting leads and a restraining bar in place; fixed battery switch; yet another replacement boat hook; spare oil and fuel filters; new sidelights for the saloon (and fitted by Brian) with rearrangement of existing cabin lights; return one of the Turkish gas bottles for the deposit; bought Brian two new pairs of shoes; and so on. We had hoped that the curved saloon windows could be removed completely and then resealed (attempts to stop the leaks had failed over the winter), but the man who came to look said they would probably break while being taken out, so he just did a great job digging out all the old sealant that he could and put in new. It works so far and the new hatch window is wonderful – you can see the clouds (or stars) while lying in bed! Similarly it had been expected that the whole engine timing case cover could be removed and resealed, but when it was explained that the engine would have to come out to do that, we went with the easier (and much cheaper) fix – which also seems to have done the job of stopping a small oil drip that had been more annoying than dangerous. So we spent a bit of money (offsetting the first instalment of my state pension) and a lot of shoe leather getting this all done. 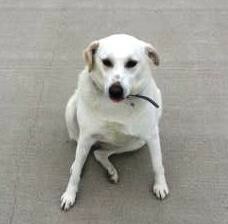 At the same time we had a couple of more domestic issues to resolve! Our friend in Glossop had despatched our quarterly prescription medications to us a month previously. Kas marina received a note from the customs office after we left that they had impounded the parcel and needed a Turkish prescription to release it! I met a very helpful woman, Jane, in Netsel who took me along to her friendly pharmacist who not only phoned and harangued the customs office, but pointed me to a friendly doctor who filled out the appropriate prescriptions for free. She then obtained all we needed to replace the missing package – no prescriptions required in Turkey but there is a price attached obviously – and offered to harangue the customs office again once the required prescriptions had reached them! Absolutely fantastic. 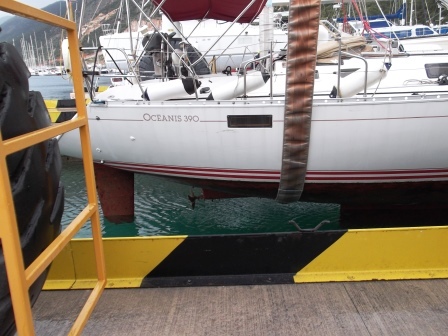 Eventually the parcel arrived at Kas Marina and is now snugged away in Petronella’s locker until we meet up with them again in the Ionian in June – hopefully. Also Brian had received an appointment to go to see the cardiologist in the UK for his 6 monthly checkup – at the end of April! It really was 6 months this time – the first time in 5 years that they have managed to do that. So we had to think ahead to where we might be and organise flights etc for him to make the appointment. What a pain! Especially as I will have to return to the UK to get a new passport sometime later this year anyway. 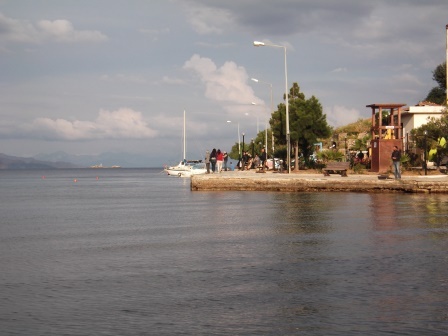 Finally everything was done, we relaxed on the following Sunday and set off again at a leisurely pace on Monday 14th April for Ciftlik – a bay with jetties and restaurants. Again we were surprised that the season had not really got going – the restaurants had not got all the infrastructure in place yet (water, electricity) for their visitors. However they were open for food and again we had a very good meal out. Eating out so often in the past two weeks has been a major change! We headed up to Dirsek Buku the next day, having been warned that here the excellent restaurant was definitely not yet open, so anchored peacefully in the centre of the sheltered bay surrounded by goats. We were joined later by a German yacht whose female (stout) crew member bravely swam to put a line ashore – brrr. The water isn’t that warm yet. Out at sea so far it has been quite cool – sufficient to put on windproof jackets and woolly hats – although inland it is warm and pleasant. 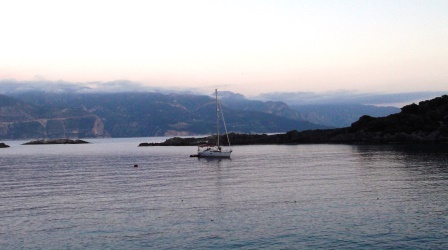 We moved on to Datca the following day sailing most of the way (no engine) on a very pleasant beam reach and spent a few days there waiting on the weather for a final dash over to Greece and Kos marina. When leaving Turkey you have to sign out formally, relinquishing transit log and getting passports stamped, which we did courtesy of the helpful agent there who we have used in the past. We also got rid of our final Turkish gas bottle, resuming use of the European Camping Gaz that is standard in the rest of the Mediterranean! We had found that the Turkish gas didn’t burn as hot (probably regulated to give less pressure) so it was good to get back to the old method. Our first evening we found a bar on the next bay around from the main harbour where they had to put tables out on the beach in order to serve beer – no alcohol allowed on the pavement terrace! A couple of dogs played along the shoreline, people fished, the sun shone, and all was well. We ended up in one of the canteen type restaurants for dinner and I had tripe soup! Haven’t had tripe for ages – it was very good. The meal was very cheap as often is the case with these places. 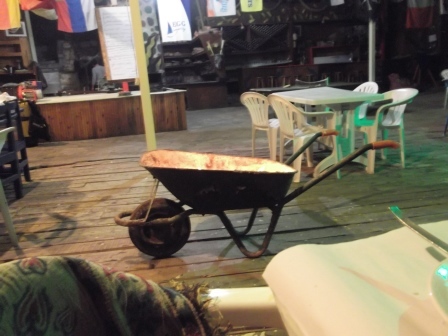 Again, in Datca harbour, they had not got ready for the new season so there was no electricity or water available. However it also meant that there was no harbour attendant either so mooring was free instead of the £18 a night usually charged! We managed to get a couple of long walks in around the seafront, examining the development of the new marina they are building. Nothing seems to have moved on since our last eventful stay here with Jessica and Mark, so the development seems to have stalled. The picture of the planned buildings shows it to be very futuristic. The flag shows it is windy out there and in the wrong direction! 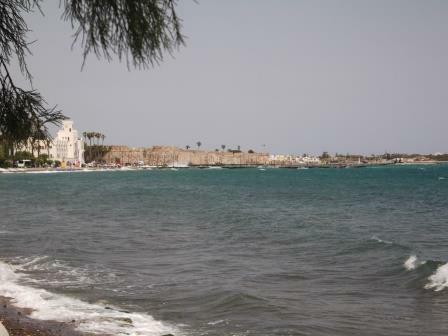 When the wind finally settled to allow us to make the 35 mile trip up to Kos it was Easter Sunday. Not that this matters in Turkey, but we were aware that it might be an issue in Greece. As it happened, we arrived and were not allowed into the marina before signing in with the port police and port authority. So we headed over to the municipal harbour as directed and were kindly allowed to tie up alongside while I dashed around the various offices. Amazingly we were not charged anything this time – perhaps because it was Easter Sunday – and were able to return to the marina in short order. It was helpful that we had done this before, so knew where the offices were. Easter Sunday and Monday everything was shut and there were a lot of fireworks going off at all times of the day and night. There was a continuous loud booming on Sunday – sounded like cannon so we thought it might be military practise, but apparently just Easter celebrations. 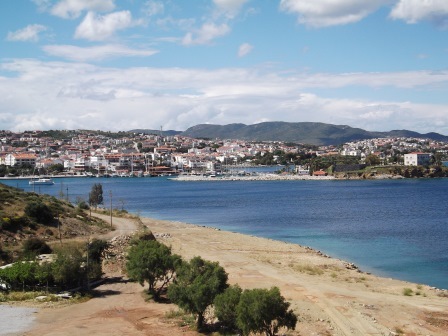 We spent Monday and Tuesday wandering around the city and getting our bearings again, Wednesday Brian caught the afternoon ferry back to Turkey – Bodrum – and then the flight to Manchester on Thursday from Bodrum. Charter flights from Kos have not yet started so this was the cheapest option as Kos marina charges about half the price of those in Turkey and we would be here for 10 days or more. So I have had a few days to get myself organised, write up this blog and do some work around the boat that I have been putting off for a while (washing, dusting, cleaning, boring!) as well as getting a new sim card for Greece for the phone and other stuff like starting our tax returns and working out some sailing routes for the next month. I have rented a bike (we abandoned ours in Kas) which makes it easier to get around as the town is spread out and shops are a distance away. The culture change from Turkey to Greece is arresting as we have found in the past. No more muezzin calling five or six times a day. Lots more bare flesh on display. A different mind set – not so much nepotism blatantly obvious (although I am sure it still applies) and somehow more relaxed although just as friendly. Shops closed all afternoon and a midweek evening and Sunday (in Turkey they are mostly open every day all day) and not so many good supermarkets in easy reach of harbours and marinas and so on. 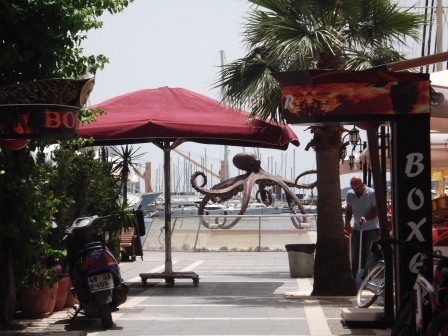 However the quality of the bread generally available is much better, and there is an excellent bakery and ice-cream shop not far from the marina! And pork is back on the menu! We had wonderful pork chops for dinner on our second night here. A final task is to put together some kind of passage plan for the next month. 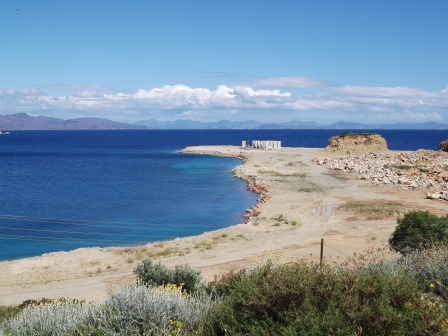 We aim to set off across the Aegean from here around 1st May, heading roughly for Monemvasia on the eastern Peloponnese coast. We have never visited the central Cyclades islands and hope to take in a few before the meltemi starts blowing by the end of May. We have been given some useful guidelines on weather “bolt holes” on the way. We will then sail (or motor) around the Peloponnese and up to the Ionian before setting off towards Italy around the end of June. Our plans after that are fluid – we usually head north during July and August to get away from the worst of the heat so we will see where that might be closer to the time. 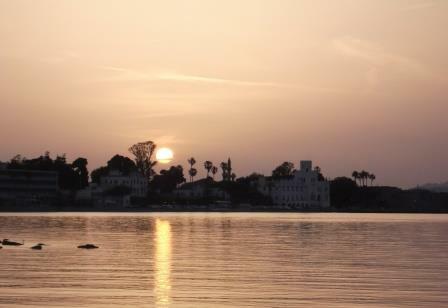 Eventually we will head for Tunisia for the winter but you will hear from me again before then!